neil has announced the resumption of development of Rawbots. Discuss your hopes, dreams and fears here. Coming soon™ to an Unreal Engine near you? Yes, we've switched over to Unreal Engine and it is going to be basically a rewrite of the code. The benefits are hopefully a much more optimized physics engine and multiplayer. I know the community and also us have been hoping for multiplayer for a long time, now we can have it. As for peerplays integration, that will basically facilitate the players having an in-game marketplace where you can sell your creations. Some of you have put in a lot of hours into your creations and this will let you profit from that. Of course, you'll also be able to share your creations for free. Will share more details as we get more things working. For now we're simply in development mode hoping this all works out. "Far be it from me to criticize geeks, I'm playing a game about flippin' trains." Its big news , who is planning a big comeback bot? also, peerplay? Unreal engine? what do you guys think about this? PeerPlay is basically a gambling plugin for money transfers.. but that wouldn't make sense for Rawbots. Perhaps we'll be able to buy our bots from each other?
" There is a long thread at bitcointalk that has some discussion about what is happening to Rawbots. I remember the devs talking about selling and buying blueprints back in the days. Rawbots has nothing to do with gambling, I think that peerplay will be used more like a platform for some sort of currency. Also I think that rawbots on ue4 is 99% confirmed, rozgo was testing the phisics in the new UE 4.14 test release, if you look at the top right you can see that the project is called "Rawbots" and the map is called "Parts Gallery"
Development of Rawbots is underway and there's nothing new to report. It is slated for a soft launch at the end of April . On the Peerplays thing. If Rawbots is planned to be a persistent-universe type MMO (like Eve Online) or even an 'instanced' universe (World of Tanks, War Thunder, Gear Up) it makes sense to have a 'secure' ingame currency. Although I am not sure how much I like having said currency having 'real world' value. How much I [dis]like the idea also depends a lot on the monetisation plan. Got some issues with this... While it depends on the pricing model, but if it's 'pay $30 up front' or 'monthly sub' based I don't really like the idea of having to pay more to access what I would consider to be 'core' parts of the game. If it's just things like 'chrome shader for armor parts' , 'wheels that leave flame trails' , 'coloured smoke trails for jets' or 'plasma cannons shoot flaming skulls' and stuff like that which is 'just for fun' that fine imo. Even in a Free To Play environment, to avoid it becoming 'Pay To Win' you can't really have things like body armor or things that give a true, measurable ingame advantage. Completely free to download and play. Supported by ethical microtransactions. Path of Exile is completely free to play - no upfront costs or monthly fees are required to enjoy 100% of the game content. You’ll notice nothing in the list above confers an actual gameplay advantage. I just really hope we don't end up with something that is little more than a cynical cash-grab. I dont think its possible for rawbots to pull off a cash grab if it wanted to. The player type is too niche, you could never sustain the churn a P2W game requires! As for the paid cosmetics, its an industry standard at this point and I think it wouldn't be too harmful. I am much more okay with an upfront cost , with the possibility of increasing that commitment down the road, than a subscription. EX: I dropped 240$ over two years on planetside 2 just buying ingame stuff as I wished, but dropped WoW because I felt like I wasn't getting enough game time for the 15$ a month subscription. Based on how "full" the final release of rawbots is, I could easily see 60$ upfront with another 60$ optional content for down the road. 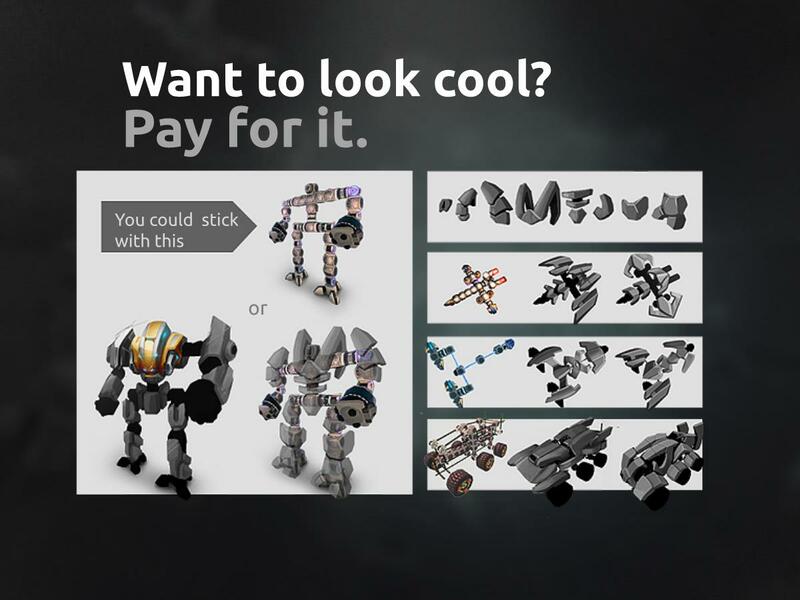 as for rawbots "gold" , A model similar to RoboCraft would be fine, as you caaaaan buy blueprints with ingame currency, but its much faster to just buy one for a couple bucks. also I noticed on the blueprint page designer and programmer have two different names. I wonder if they have plans for allowing us to create community bulletin "quests" so to speak. Like I can post a need for one of my bots to be programmed, and offer a price, or I can request a bot to fill a roll, and pay other players to design and program said bot? still I really hope investors get interested in rawbots. I think I speak for everybody here when I say I love the concept and that the gaming industry really needs a good robot building game again. I would have a solution specifically for the armor pieces issues. Make them intangible and collision-less. Here's why. 2. Adding cosmetic parts to a bot that needs to be functional wouldn't add any unwanted mass. 3. Since cosmetic armor would be physicsless, you could add it to bots without increasing their "real part count", which matters in some contests. 4. Physicsless armor could be made not to use any precious attach points and to instead be surface attached. 5. Some of the armor parts shown on that picture seems to have a complex shape. Making an accurate collider for those sounds like a challenge. 6. It would be possible for player to pay for the privilege of creating their own 3d models of armor (and sell them to others with a royalty, creating a new design should be several times the cost of buying a copy of an already created one) That would help a lot with building flexibility and would please perfectionists. Also encourages community interaction. 1. Solid looking armor would look strange if it didn't collide with anything (as if the programmers were lazy). You'd need to go with an energy projection/virtual/slightly translucent look for armor pieces. Also, it would be cool to have a subtle visual effect trigger when an armor piece overlaps another cosmetic or physical part (kinda like the sparkles of the laser) Hopefully unreal 4 could help you there. points may need to be altered. Functional armor is already 100% possible to create without these fancy parts (as pressureline's bots shows) but it isn't very effective against lasers and grenades anyway. These can go through anything that isn't like >4 blocks thick, including terrain. Fixing this issue should be trivial for lasers, but somewhat harder for grenades. Your suggestion could work too, of course. It's great to see Rawbots is getting a proper revival. I don't know how I managed to miss all the recent goings on despite having the ACL thread open since the summer. I wonder if the move to the Unreal engine will be as drastic as changing to using bullet for physics was back in the day? Perhaps a way to create semi-custom body/armour panels similar to the procedural fairings in KSP would allow for an intermediate solution between custom decorative parts and just using the standard existing parts. Maybe you are already aware, but rozgo and neil reportedly are working together again. Also, "Perhaps a way to create semi-custom body/armour panels similar to the procedural fairings in KSP would allow for an intermediate solution between custom decorative parts and just using the standard existing parts." 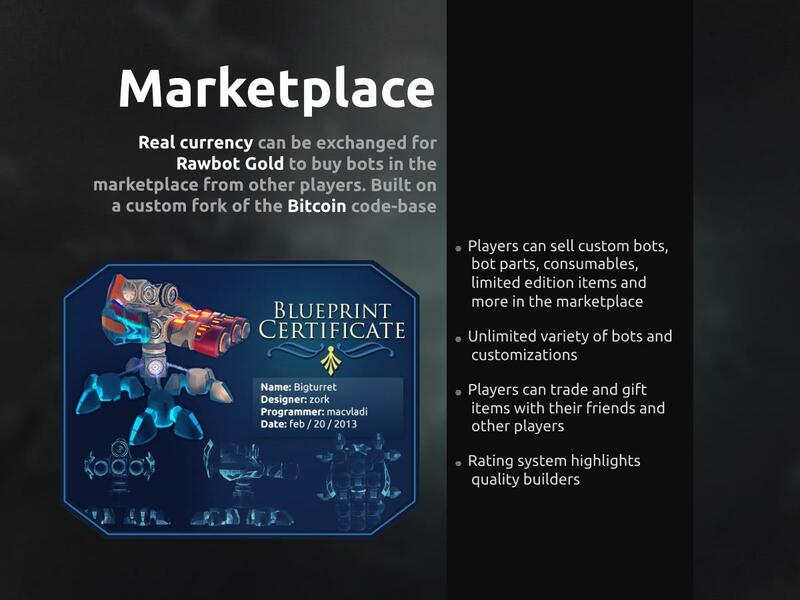 Do you have any details on the interaction between Rawbots ingame money (please call them botcoins) and real money? How will it work with 'unrestricted' private servers? Is it possible to earn botcoins via ingame actions? (ie: extracting and processing resources) Can I convert botcoins back into USD? What protections against the system being used for illegal activity (money laundering etc) will be in place if the botcoin-USD conversion is a 2-way street? What plans (if any) are there to pursue getting Rawbots onto Steam?